This lake view condo is nestled in the heart of Lake Las Vegas Resort at the Montelago Village has been fully renovated, including an in unit WASHER/DRYER. The only 1 bedroom in Lake Las Vegas with in-unit laundry. This charming 700 square foot condo offers one bedroom and one bathroom with a living room, full size kitchen and dining area. It also features a large 150 square foot veranda with views of Lake Las Vegas, the 18th tee of the Reflection Bay Golf course, mountains, courtyard/pool, and the village. There is secured underground parking. The condo is professional cleaned/managed and maintained to hotel quality standards. The living room offers comfortable seating for 4 with a Flat screen/smart TV with NetFlix/Amazon, dvd player, Dish Network HD/DVR, wireless/wi-fi high speed internet. The fully equipped kitchen offers a gourmet 5 burner samsung range, upgraded Kitchenaid microwave and full size refrigerator/freezer and granite counters.The dining area has a table with seating for four people. The oversized private veranda has comfortable seating for 6 on the sectional sofa to relax while taking in the breathtaking views. The master suite has a king size bed, flat screen TV and attached full bathroom with a soaking tub and separate shower. This condo is located steps away from the the village restaurants, pubs, shops, grocery store and marina. There is also access to an exercise room. The photos in my ad are the actual views from the patio and not the stock Lake Las Vegas photos others use. Keywords: Lake Las Vegas, Lake view, Montelago Village, Viera, casino, restaurants, Marina, kitchen, large patio, king bed,Wireless, Wi-Fi, Corporate rental, relocation, Westin, Ravella Spa, Hilton, Golf. We live in Seattle and needed a respit from the gloomy winters. 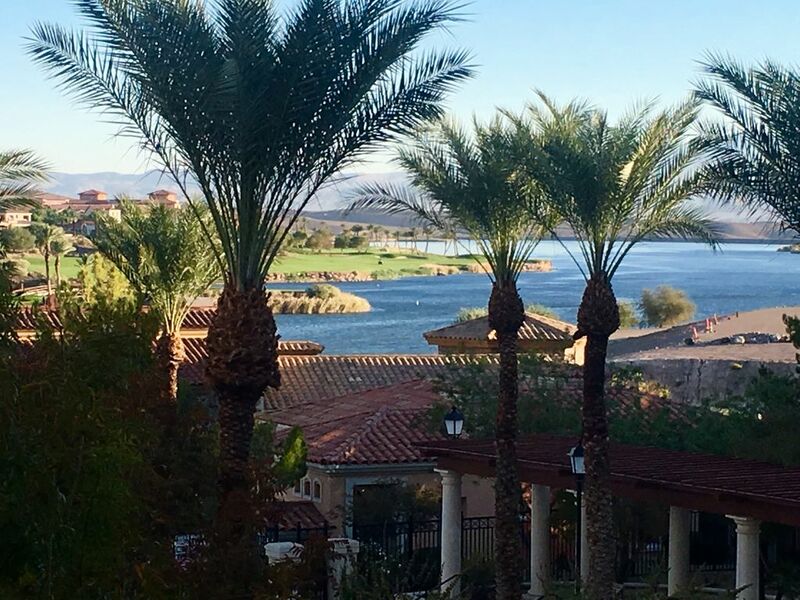 Lake Las Vegas was the perfect choice for year-round sunshine and has a quiet relaxing resort feel. While we enjoy the strip for the entertainment it provides, its nice to come back to Lake Las Vegas for peace, quiet and the beauty of the desert. We fell in love with Lake Las Vegas the minute we saw it in 2006. It's certainly a world away and makes you feel like you have traveled to Italy. We were lucky enough to be able to purchase this condo in 2009. The restaurants are all very good and there is a nice community feel in Lake Las Vegas. We always feel like we are on vacation when we visit our Lake Las Vegas home. Lake Las Vegas is in the process of an amazing resurgence that will make it even better!!! Relfection Bay Golf Course, a top 10 public course in Nevada and top 100 in the country will re-open in the Fall of 2014. The Westin is in the neighborhood as well as the Hilton with the Ravella Spa. Hilton is also re-opening the casino later this year, which will now be owned by the Hilton and not a sub contractor which will make operations more seamless. Our Viera condo is located directly in the village. Its the ONLY 1 bedroom with the benefit of in-unit laundry. With other 1 bedrooms, you only have a shared laundry room. Literally steps away from the shops, restaurants, marina and casino. Sunsets shining on the lake and mountains are amazing sitting on the private large veranda and the chaise lounge is great for reading and afternoon naps. Our patio has walls on each side, making it feel like an additional room. Most of the balconies are not private and only have railings. The Marina is also steps away so you can rent a kayak, peddle boat, stand up paddle or rent a 10 passenger party boat for happy hour on the lake. Viera has 2 pools, one heated, one not heated, plus a large hot tub. On the weekends, the mexican restaurant has Jam-eoake, which is Karaoke to a live band. It's fun to participate or just watch! During the spring/summer/fall, there are movies and live bands on the weekends and beer fests/wine walks. Bathroom has door from the bedroom and living room. 18th tee of Refleciton Bay Golf course. Lake Las Vegas is steps away from the condo. Linens/towels are provided. Daily Maid service for cleaning/linen change for an additional charge. underground secured access with room key. In the condo and throughout the property. Kitchenaide French door with ice and filtered water tab inside the door. Gourmet Kitchen includes Samsung 5 burner convection oven, and upgraded Kitchenaide french door refrigerator, microwave and quiet dishwasher. HD-Flat screens in Living room and Bedroom with Dish Network DVR. LG TV also has direct access to Netflix and Amazon. DVD rental in lobby. (similar to Red Box) with new releases etc. Large 10' x 15' patio with sectional sofa and dining table. bike rack in secured garage. Large covered open, yet private patio. Approxmately 150 square feet with large sectional sofa and dining table. 2 pools. 1 heated. 1 has gradual walk in. Largest patio in Viera, close to the Marina, village, casino, restaurants, exercise room. The only 1 bedroom with in-unit washer and dryer. My wife and I have stayed at the Viera condos four times in the past two years, and this unit was tops. Great view, nicely furnished, fully outfitted kitchen. David was great to work with on our last-minute reservation (and a snafu or two with VRBO). We will definitely shoot for this condo again on our next visit to Lake Las Vegas. Very quiet at Lake Las Vegas this time of year, just what I was looking for. This property is definitely a real home-from-home. There is everything you could possibly need. Very comfortable and immaculately clean. The resort itself is has some great restaurants and fabulous views. Our host was also very helpful and communicative providing all we needed to know to make our stay as enjoyable as possible. The condo was exactly as described. Perfect location within walking distance of restaurants and market. Condo was clean, beautifully updated, well maintained and quiet. Kitchen had all the essentials, and the washer/dryer was very convenient. Owner was extremely responsive as well. 100% recommend! We quite enjoyed our stay at this resort recently. Our condo was very nice indeed. Very comfortable and had everything we needed for our home away from home. The resort was very nice and we liked being a distance from the noise and commotion of Las Vegas itself. We rented a vehicle so could get around on our own. I would definitely recommend staying here! The Hilton/Ravella Spa and Westin Hotel/Resort and Spa, Casino Montelago & the village are located within walking distance of the condo. Rental agreement will be emailed to guest. Deposit and payments generally made through Paypal invoice which will be emailed to the guest.